When we think of leaves in winter, we usually see them as being dead. As the daylight decreases many plants automatically cease connections to their leaves therefore stopping the photosynthesis process. The green chlorophyll starts to diminish which is vital to photosynthesis and before long the leaves change colour and fall off. However, there are plants and trees that keep their leaves and produce photosynthesis throughout the winter months. These include the conifers (pine, firs, spruce) because they keep the chlorophyll in their needles and use the smaller amounts of energy it produces during the winter, which is useful because of the protection winter-photosynthesizing plants have. Plants that perform winter photosynthesis spend time during the spring and summer storing energy. Some plants even have bulbs or tubers that hold the energy in special collections of starch cells. In the cold months, plants can convert these starch cells back to simple sugars that can be used to produce energy for the plant’s system, or to provide energy for new growth in the springtime. 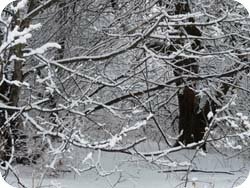 Plants that grow throughout the winter also tend to store energy to help them get by in the cold months. The reason even photosynthesizing plants need so much extra energy in the winter is because of the temperatures. While in many places cloud cover can limit access to sunlight, the real danger lies in the lower air temperatures, which of course, lowers temperatures inside the plants. The cold causes all the process of photosynthesis to move more slowly, making the chemical reactions sluggish and transfer of nutrients a much longer process. This is due to the absence of heat on a molecular and atomic level, making it more difficult for molecules to move about and exchange parts in chemical reactions. If temperatures fall too low, leaves can die completely. To protect themselves from this, winter-photosynthesizing plants produce very hardy leaves that withstand even freezing temperatures. Broadleaf plants that survive in winter have very tough, waxy leaves that also prove to be an unpleasant meal for animals and keep the chlorophyll pigments safely tucked away under a natural shield that still lets sunlight pierce through to the cells. Keep in mind that these plants do not have their maximum nutrition levels because it is winter. They will return though once their growth continues in spring. Tubers and bulbs (root vegetables) from Cattails or Jerusalem Artichokes can be used as food also, but depending on how frozen the ground is, you may not get at them. Many trees and many parts of them are a great source of food in the winter however, they can be labour-intensive to harvest depending on what part you are harvesting. The obvious trees in winter to look to for food are the conifers. Pine, spruce, fir, tamarack and hemlock all have high levels of vitamin C. Also remember that the juniper is also a conifer and many have berries throughout the winter. Most pine and spruce trees (there are many sub-species) contain beta carotene. The juniper contains vitamins A, B1, B2, B3, C, calcium, chromium, cobalt, iron, magnesium, manganese and phosphorus. Tree bark can be collected and ground into a powder and used as flour to bake or if in a survival situation, mix with water and make a “pancake”. The most nutrition will be located in the inner cambium. Needles can be collected, dried and ground into a powder. Use these as a seasoning to enhance a meal. Or, you can use the needles to make tea. Hemlock needles are soft enough that these can be eaten raw. The sap from a pine or spruce can be chewed on (like gum) for the nutrition. When frozen, it can be warmed up in the hands first so that it can be chewed. The most amazing tree to consume by far is the birch tree. There are many species of the birch tree but all provide a wealth of nutrition. Chaga grows on living trees and although it looks ugly, it is full of life-giving nutrients. Birch polypores are edible as well, although in the winter they will be very tough. The bark, twigs, and even the older catkins that hang in through the winter are all edible. In spring leaves and buds are edible as well. Other deciduous trees that are edible (inner cambium, spring leaves, catkins) include aspen, beech, maple and willow (although eating a lot of the willow bark or catkins is not recommended because it contains salicin. Some maple trees keep their seeds throughout the winter and although they lose moisture content, they are still edible. For more information on eating trees a fantastic read is Linda Runyon’s Eat the Trees. Linda Runyon has lived most of her life as a forager and as an educator of wild edibles. Wonderful article, well written, factual. concise, and perfect for me to e-mail people to……thank you so much for writing it with Eat the Trees as a reference! I will be using your efforts over and over as the main question all winter (winters) are; ” What can you eat in the winter?”. Oh my gosh I have goosebumps. I was interviewed the other day on CBC radio (which is big here in Canada) but your words of kindness mean so much more as you are truly an authoritative voice on wild edibles. You truly have made my day!!! When mentioning that pine needles are edible it would be good to warn people that a tea from a minimal amount of ponderosa pine needles is a surefire way to cause an abortion to humans or animals. Otherwise women possibly will needlessly be losing their babies. This is why I have a disclaimer on the website – always do thorough research first. Many plants can cause interference with lactation and yes, sadly some can cause spontaneous abortion.